on heating and cooling costs. It is a spray applied insulating foam plastic which sprays as a liquid and then expands to make an air-tight seal. There are two different types of spray foam that you can utilize for your building: closed and open cell. Open cell spray foam is lightweight, pliable, and very easy to work with, while closed cell foam is rigid and very dense. 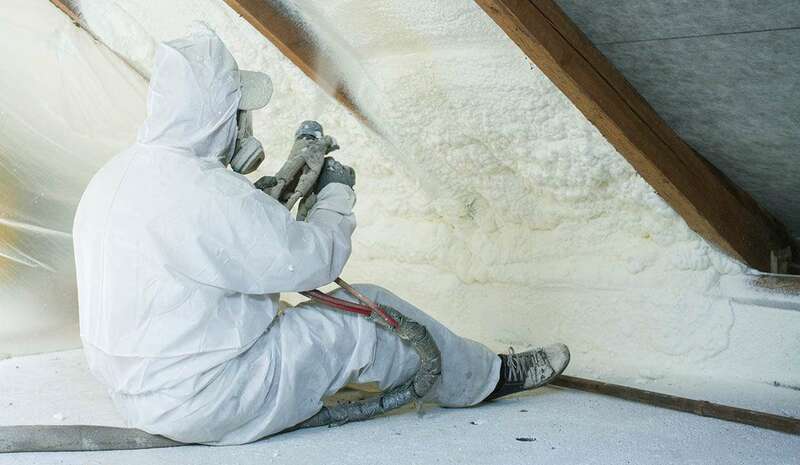 When coming out to your building, our expert estimators will know which sort of spray foam would be best for your specific needs. As much as 40% of a building’s energy is lost due to air infiltration. Energy bills can soar if there are holes, gaps and air leaks in the structure. Open and closed cell spray foam performs as and air carrier and insulation that closes gaps, preventing air from escaping. According to the EPA, as much as half of your energy in a building goes to heating and cooling. Maintenance of your heating and cooling appliances, coupled with proper insulation can reduce as much as 50%. Fixing the air leaks that waste energy and money is instant and efficient. Heating and cooling account for up to 70% of your buildings energy use. By insulating you would be able to save up to 50% on not only your winter, but also your summer energy costs. By insulating locations such as walls, ceilings, and basements, you are creating a barrier to moisture, pests, and mold. 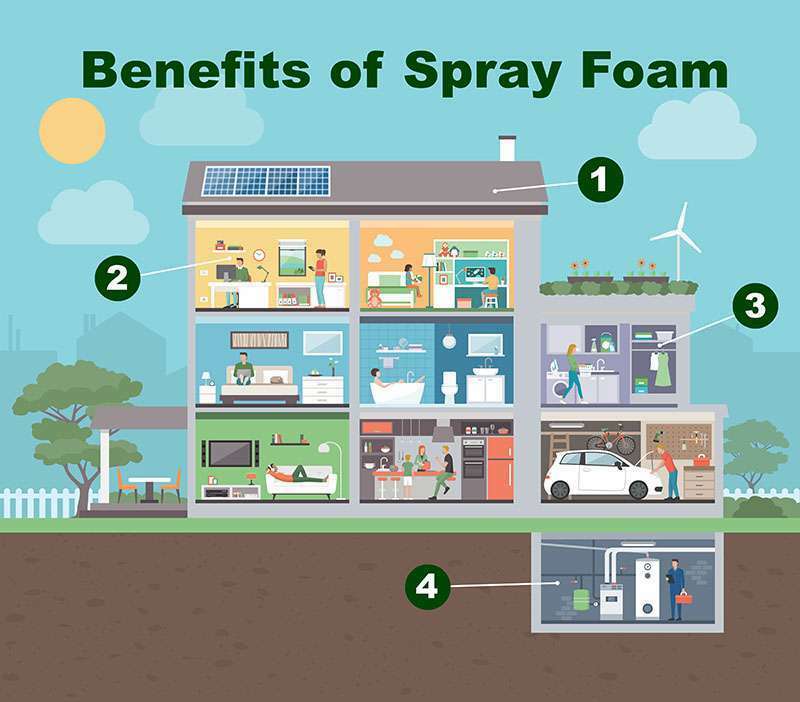 Spray foam creates an environment in your building that is crisp, dry, and in which you can breathe freely. Between winter storms, Nor’easters, and the summer heat, homes in New England have to face a lot. That is why when new property owners are shopping for their place to call home, they value insulation due to its energy savings and its ability structurally strengthen a home 75-200%. The air-tight seal of spray foam gives you the advantage of insulating difficult to reach and uneven spaces without compromising your warmth, or all of the barriers that spray foam provides against the environment. We use a non-hybrid spray, which means that we do not mix inferior insulation with our spray foam. This makes our spray foam more dense for a tighter seal, and your property much warmer for it. We make sure to have the finest machines in the industry so that we can seal your property tightly. Our machines allow us to give you an even spray, which ensures that the spray foam is perfectly attached. Our technicians are not only certified by OSHA for Safety, but they also undergo a thorough training process which trains them to solve problems on the spot, to use high tech machinery, and to give you the high-quality service that you deserve. Our estimators and technicians value you, your time, and your business. We do our very best to ensure that this experience is as transparent and as easy as it could be so that you know you are getting the finest service in New England.